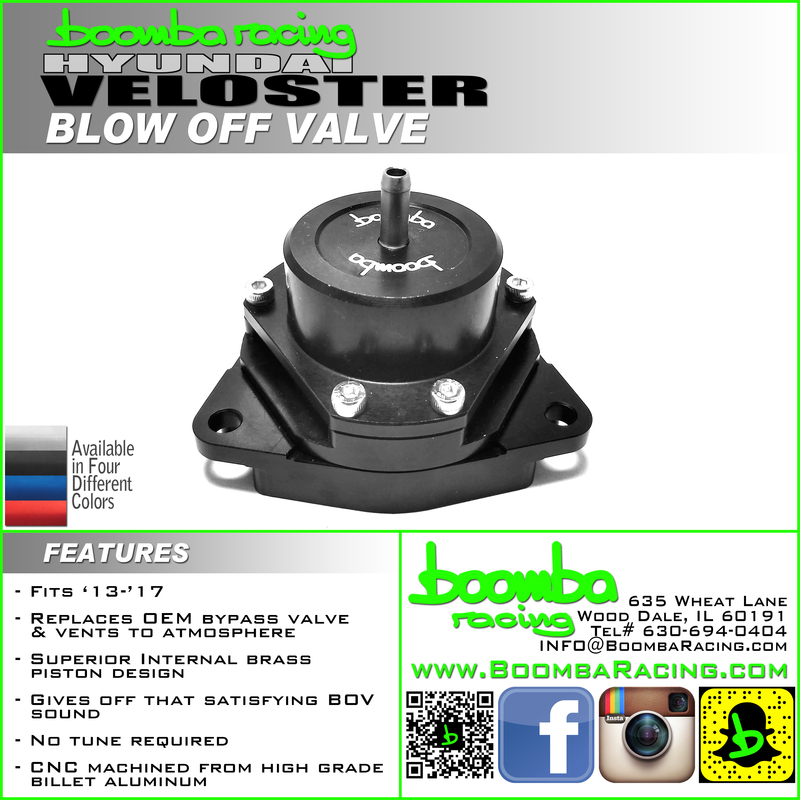 Boomba Racing is proud to announce the release of our VTA BOV for the 1.6T Gamma engines! -This is a direct replacement to the factory unit, (NO CUTTING REQUIRED) and is proven to be leak free up to 100PSI! Last edited by Boomba Racing; 02-22-2019 at 12:06 PM. Please update your site to show Veloster TURBO. We don’t need any NAV people asking if they can use this. That pressure fitting on top needs to be a 90° fitting pointing rearward or people will have to cut the plastic cover. Also, I hope you test this with both the factory RCV control solenoid and aftermarket solenoids like the MACs. It would be wise to go with a directional outlet that faces away from the front, which could be used to either recirculate or leave open. Radial-type outlets are bad because a lot more dirt gets in them, requiring maintenance more often. Removing the bumper to maintain aftermarket radial OEM location valves increases the chances of breaking the bumper clips that are attached to the headlights in a particularly fragile manner. Just speaking from 5.5+ years of experience with this car. Last edited by E9C900A; 01-11-2019 at 05:01 PM. Way late in the game... Also there are plenty of other, better, options that this. Just seems like a a waste of time. Too bad they are late to the game and didn't even bring along something innovative. This is still a spring based BOV, so I'm sure we will see CELs pop up sooner rather than later. I said that on FB when they first posted. The next gen vehicle is already out and they’re just introducing one for the last gen, that needs cutting. It’s gotta be best in class with zero chance of cels, and still they probably won’t sell many. Last edited by weinerd; 01-14-2019 at 12:00 AM. TrinityVT and DedMemBRaiNE like this. Nope, Because we remove the recirculating air duct, this sits much lower, and doesnt need a 90 Degree vacuum fitting. We have been using a similar design of BOV for other vehicles for over 10 Years, and we have no issues with our design! These can hold over 100 PSI and last the lifetime of the car! ZERO chance for a CEL and NO cutting Required with our design. We took this a few steps further than our competition, to ensure that we make a product for you guys, that will not only last a lifetime, but is easily reversible. The reason we made this for the first gen, is that we are going to be making a second gen BOV, and want to support both generations! How do you figure zero chance for CEL? We have been avidly testing this product on our shop car, from on our in house dyno, to cruising around on the streets/highway. We have put roughly 10,000+ Miles on our shop car, with this installed with zero issues. A lot of manufactures don't take the factory spring rate into account, and that is why you run into the P2261. Our engineers were able to design this in a way to ensure that it mimics the operation of the stock BPV, but with our quality backed behind it! Hope this answers your questions!